Fabulous prizes are on offer at tonight’s 12th Annual JustWorld International Gala at Belle Herbe Farm in Wellington, Florida, with a range of auction items up for grabs. The ancient Greek themed party, presented by Caryl Philips and Frank Zeiss, kicks off at 7pm at Belle Herbe Farm in Wellington, Florida, with the live auction held midway through the night. 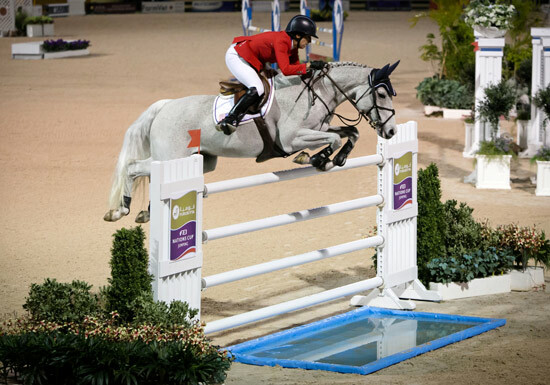 Among the items equestrians will be vying to win is a private clinic with Olympic gold medalists Laura Kraut (US) and Nick Skelton (Britain). Billed as a “once in a lifetime riding experience for you and three horses”, the winner will jump at the beautiful Belle Herbe Farm field in Grand Prix Village and finish the day with catered lunch, all donated by Laura Kraut, Nick Skelton and Maria Newman. BBQ Gaucho Style, donated by Cilantro’s, polo players Nic Roldan, Brandon Phillips and Carlitos Gracida, and singer/guitarist Tom Blake. The night will featured a catered Asado and cocktails for 40 people with celebrity guests Nic Roldan, Brandon Phillips and Carlitos Gracida as well as musical entertainment from Tom Blake. Viva la West Palm Beach! donated by Rocco’s Tacos and the Hyatt Place West Palm Beach. It includes a tequila pairing and dinner for ten people at Rocco’s Tacos accompanied by four double guest rooms at the Hyatt Place in West Palm Beach. A Monday Funday Cruise on a luxurious Hatteras 61-foot yacht will take up to 10 people including a captain, first mate and chef on a private day cruise complete with a catered meal, in Palm Beach and all made possible by the generosity of Gary and Donna Duffy. VIP Package in Las Vegas, with the winner enjoying three nights at The Bellagio Resort and Casino with VIP check-in, limousine service to and from the airport and two tickets to Cirque du Soleil’s “O” Show, all compliments of the Bellagio. Weeklong Moroccan Getaway, with the winner enjoying a seven-night stay at the tremendous Selman Marrakech Hotel, donated by the hotel. Guests will enjoy a sprawling Henri Chenot spa, rooms with French designer flair, a palm-tree flanked Olympic-size swimming pool and Arabian horse shows. Transatlantic Roundtrip Airfare for One Horse donated by the Dutta Corporation, this package includes a round trip ticket for a single stall and for three-day USDA quarantine upon return. Five Night Guatemalan Experience for Two gives the winner five nights at the luxurious Casa Santo Domingo Hotel Museum, donated to the live auction by Juan Andres and Michelle Rodriguez. The package includes daily breakfast surrounded by nature, art and culture, a thrilling canopy ride in the Parque Cultural Efrain Recinos, a relaxing massage by internationally trained therapists, transportation to and from Guatemala City and a personal visit to Los Patojos with Juan Pablo Romero Fuentes, founder and director of Los Patojos and a 2014 CNN Top 10 Hero. As well as the live auction, more than 90 other silent auction items will also be up for grabs, including a custom pair of Fabbri boots, up to a $2000 value; a table for eight in the VIP tent at the American Gold Cup; an EquiFit half pad, ear bonnet and D-Teq open front boots; a fine art print by Shelli Breidenbach; and five custom jumper training course designs by 2016 Rio Olympic Games course designer, Guilherme Jorge. OK all you aspiring jumper lads and lassies here is the opportunity you all need, go for it, it will be well worth the experience.